Spanish physician, diplomat, and patron of Jewish science; born about 915 at Jaen; died 970 or 990 at Cordova. His father was a wealthy and learned Jew of Jaen. 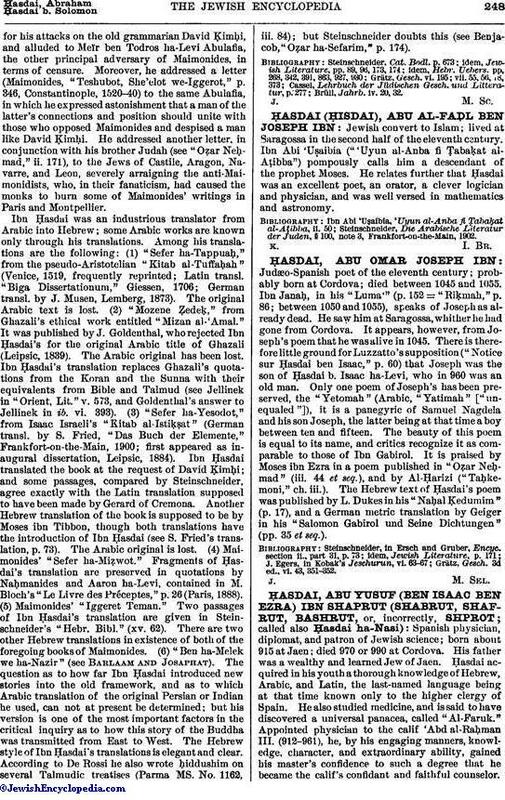 Ḥasdai acquired in his youth a thorough knowledge of Hebrew, Arabic, and Latin, the last-named language being at that time known only to the higher clergy of Spain. He also studied medicine, and is said to have discovered a universal panacea, called "Al-Faruk." Appointed physician to the calif 'Abd al-Raḥman III. (912-961), he, by his engaging manners, knowledge, character, and extraordinary ability, gained his master's confidence to such a degree that he became the calif's confidant and faithful counselor.Without bearing the title of vizier he was in reality minister of foreign affairs; he had also control of the customs and ship-dues in the port of Cordova. Ḥasdai arranged the alliances formed by the calif with foreign powers, and he received the envoys sent by the latter to Cordova. In 949 an embassy was sent by Constantine VII. to form a diplomatic league between the hard-pressed Byzantine empire and the powerful ruler of Spain. Among the presents brought by the embassy was a magnificent codex of Dioscorides' work on botany, which the Arabic physicians and naturalists valued highly. Ḥasdai, with the aid of a learned Greek monk named Nicholas, translated it into Arabic, making it thereby the common property of the Arabs and of medieval Europe. Ḥasdai rendered important services to his master by his treatment of an embassy headed by Abbot Johannes of Göritz, sent to Cordova in 956 by Otto I. The calif, fearing that the letter of the German emperor might contain matter derogatory to Islam, commissioned Ḥasdai to open the negotiations with the envoys. Ḥasdai, who soon perceived that the letter could not be delivered to the calif in its present form, persuaded the envoys to send for another letter which should contain no objectionable matter. Johannes of Göritz said that he had "never seen a man of such subtle intellect as the Jew Ḥasdeu" ("Vita Johannis Gorziensis," ch. cxxi., in Pertz, "Monumenta Germaniæ," iv. 371). Ḥasdai secured a great diplomatic triumph during the difficulties which arose between the kingdoms of Leon and Navarre, when the ambitious Queen Toda sought the aid of 'Abd al-Raḥman in reinstating her deposed grandson Sancho. Ḥasdai was sent to the court of Navarre; and he succeeded after a long struggle in persuading the queen to go to Cordova with her son and grandson, in order to prostrate herself before the calif, her old enemy, and implore the aid of his arms (958). The proud Navarrese allowed herself to be vanquished by Ḥasdai—as a Jewish poet of the time expresses himself, "by the charm of his words, the strength of his wisdom, the force of his cunning, and his thousand tricks." Ḥasdai retained his high position under 'Abd al-Raḥman's son and successor, Al-Ḥakim, who even surpassed his father in his love for science. Ḥasdai was very active in behalf of his coreligionists and Jewish science. When he heard that in the far East there was a Jewish state having a Jewish ruler, he desired to enter into correspondence with this monarch; and when the report of the existence of the state of the Chazars was confirmed by two Jews, Mar Saul and Mar Joseph, who had come in the retinue of an embassy from the Slavic king to Cordova, Ḥasdai entrusted to them a letter, written in good Hebrew addressed to the Jewish king, in which he gave an account of his position in the Western state, described the geographical situation of Andalusia and its relation to foreign countries, and asked for detailed information in regard to the Chazars, their origin, their political and military organization, etc. See Chazars. Ḥasdai sent rich presents to the academies of Sura and Pumbedita, and corresponded with Dosa, the son of Saadia Gaon. 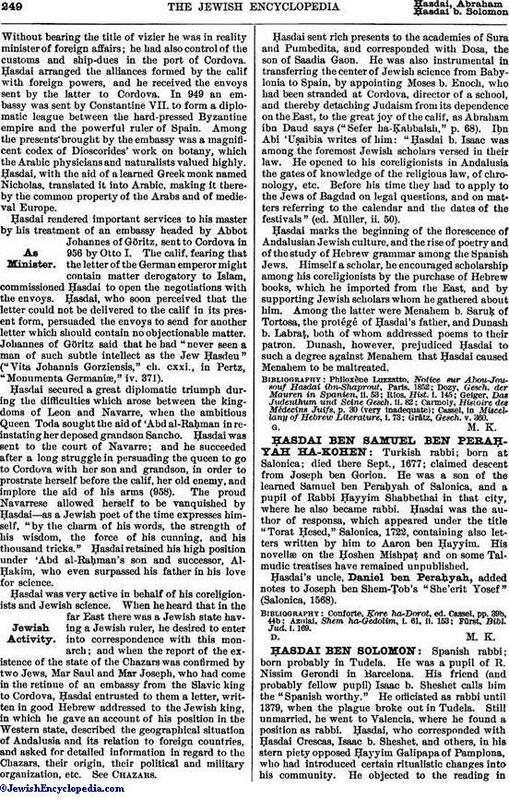 He was also instrumental in transferring the center of Jewish science from Babylonia to Spain, by appointing Moses b. Enoch, who had been stranded at Cordova, director of a school, and thereby detaching Judaism from its dependence on the East, to the great joy of the calif, as Abraham ibn Daud says ("Sefer ha-Ḳabbalah," p. 68). Iḅn Abi 'Uṣaibia writes of him: "Ḥasdai b. Isaac was among the foremost Jewish scholars versed in their law. He opened to his coreligionists in Andalusia the gates of knowledge of the religious law, of chronology, etc. Before his time they had to apply to the Jews of Bagdad on legal questions, and on matters referring to the calendar and the dates of the festivals" (ed. Müller, ii. 50). Ḥasdai marks the beginning of the florescence of Andalusian Jewish culture, and the rise of poetry and of the study of Hebrew grammar among the Spanish Jews. Himself a scholar, he encouraged scholarship among his coreligionists by the purchase of Hebrew books, which he imported from the East, and by supporting Jewish scholars whom he gathered about him. Among the latter were Menahem b. Saruḳ of Tortosa, the protégé of Ḥasdai's father, and Dunash b. Labraṭ, both of whom addressed poems to their patron. Dunash, however, prejudiced Ḥasdai to such a degree against Menahem that Ḥasdai caused Menahem to be maltreated.